December always brings a cheerful atmosphere. Who doesn’t love the holidays? Family, fun, time off, somehow everyone seems to be more cheerful around this time, which makes me smile. But it also means more parties, entertaining, decorating and gifts. We don’t want to be happy for just one month and worry about paying December credit card bill throughout the next year. So here is my list of money saving tips for the holidays. With a little planning you can save money, reduce stress and have a fun filled holiday. Make a gift plan : Create a gift plan with the list of all recipient, ideas for gifts, if you don’t have ideas – write down their interest to find something, MAX dollar amount. Stick to your budget : If you cannot find an ideal gift within your budget, make do with whatever the best gift you can find within your range. There is no point in going into debt for this. Instead show your love using a heart felt letter or spending time with them. Make do without the gift giving for adults. Instead, have a get together and give gifts only for the kids in the family. Comparison shop : Know the prices before you get out of the house. If you have to go on a “pre-shopping” trip, so be it. Don’t buy anything on this pre-shopping trip, just note down the prices for all the gifts in your list and go home check the prices online along with shipping. This should give a better idea of the price range and the best place to buy. Stick to the gift list : I am very bad at this. I change my mind as I go along, this is the first year I have decided what I am buying and bought just that. This tip alone saved me a lot of money. Look for deals and sales : If you are buying online, google [store name + “coupon”] you will end up with some coupon, even if it is for free shipping, you are saving money. Buy in bulk : For commonly used items like holiday treats or baking supplies, try to buy in bulk along with a neighbor, family or a friend. Homemade gifts : Instead of buying gifts make your own gifts. Here are some ideas to get you started – 73+ homemade gifts. Give time : Give your time instead of money or a gift. Get a part time job : If you can spare some time, consider getting a part time job in a department store. You could make some money for the holidays and also make use of the employee discounts for all your gifts. Wrapping paper : Instead of buying wrapping paper, make your own with your kids artwork. This will be more personal than newspaper wrapping and will mean something to the recipient as well. Involve the kids and make a project out of it. If you have to buy wrapping papers for cheap, the dollar stores are good for this. Make ornaments : Similar to the wrapping paper, instead of buying expensive ornaments, make ornaments from kids artwork or with some meaningful photos. Food drives : Instead of office gift exchanges, suggest a food drive where you can bring canned and non-perishable food for the local food bank. This won’t save much money, but at least you are not stuck with buying a lame gift for a coworker you don’t even know well. Pot luck : For parties (whether you are attending or hosting) suggest pot luck instead of just one person doing all the cooking and cleaning. Saves time and money. Pick your parties : Attend the parties that are more meaningful to you and skip the ones from an acquaintance or coworker you don’t know well. Plan your vacations : Traveling a day earlier or later can save a lot of money. Skimp on outdoor lighting : Consider going light with the lighting. You can also use LED lights, they use much less energy so you won’t get stuck with a humongous power bill in January. You could also change the regular bulbs to a colored one to add festive effect and leave it at that. Don’t replicate your parents : This is one of the mistake I make, not with just holidays, but generally. I forget that it took my parents probably 50 years to collect all the stuff they have. I am just starting out so there is no need to have it all the first time. Buy throughout the year : It is not possible to do this for this year, but the best time to shop for Christmas is the week after Christmas when everything Christmas-related goes on clearance. Stock up on stuff that won’t get spoiled – decorations, ornaments, gift wrapping and even gifts. What are your favorite money saving tips? Do you have a weakness or you always plan well? My wife makes a few gifts each year. It is personal and my wife enjoys making it. My post yesterday discussed not only setting a budget, but keeping tabs against it after every purchase. If you go to the mall on a shopping spree and try to add up in your head what you think you spent on each person, with the goal to stay in budget, chances are your brain will go haywire and you’ll overspend. Keeping track after each gift purchase is a must-do step. Great tips! For mailed gifts I try to find light-weight items, have items shipped directly to recipient or else give a gift card. I use a skein of red yarn to tie up gifts for quick, easy, inexpensive, & uncrushable bows. There are several handmade gift ideas on my blog also. Thanks! I just used credit card points to get a gift certificate that allowed my to buy all of C’s gifts. In a sense, I still went overboard because I spent more than I would have without the gift card. We always get some $5 gift cards for a used book store. We give one to everyone who comes to our house on Christmas (we host), and if we have more than we have people, well, then we have gift cards to use toward books for ourselves. Great tips Kay lynn – I usually try to get a good list going and then a shopping list for things that I need when I’m DIYing gifts. Good list Suba – we don’t plan on buying any more Christmas lights, and in fact haven’t bought any in some time. Just the consequence of having gone a little overboard in years past. What the heck, the kids enjoyed them so. Now we just use the ones that are still good, and are scaling back a little more every season. My biggest money saver is to tell friends that I don’t do presents. We can just go out for happy hour (paying for ourselves) and enjoy each other’s company. I only buy presents for family or a girlfriend (now single, so I can save on that one). I’ve been stressed about money during the holidays all week, and the simple reminder to “make a budget” was all I really needed. Budgets change during the holiday season. Obvious yes. But such is all wisdom. I love making custom canvas art for people out of their favorite photos. It’s really easy and cheap to do. My fave to use is canvas4life.com because they are cheap and ship fast! Hi everyone! I’d like to invite you all to join Manilla with financial editor Farnoosh Torabi at 3pm EST today for a live Twitter Chat about how to save money during the holidays. There are lots of great tips here, so I hope you’ll participate in the chat and ask questions. Looking forward to it! These are great tips for any gift-giving occasion! Iâ€™ve recently gotten into craft making especially buying big brooches and necklaces from thrift stores for just a couple bucks and making them into hair clips and barrettes. I didnâ€™t think of it but I couldâ€™ve easily given these to my sister and mom. When their birthdays come around you can bet thatâ€™s what Iâ€™ll be doing. In the meantime I save money regularly by changing small habits like packing my lunch every day and subscribing to services that charge monthly prices in place of several charges throughout the month. For example I work for DISH and got the Blockbuster Movie Pass as an add-on to their services for ten dollars a month. I no longer pay rental fees by the movie or even late fees and save a ton by staying in instead of going to the movies. Itâ€™s definitely worth the ten dollars. Friday Night Links: When Did Cheap become Chic? Friday Night Links: Boomer or Late Bloomer? 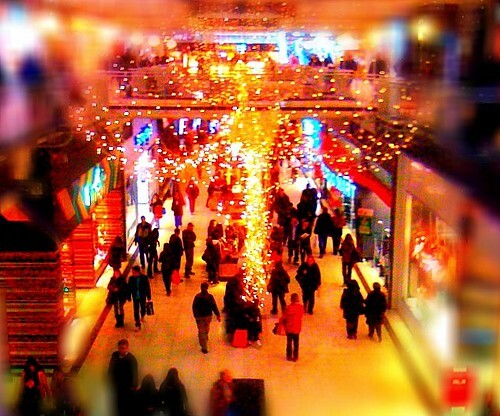 Previous post: Greed and Violence: A Black Friday Tradition?